Enter Kasthuri Kumar aka Katie, detective with a buzz and two bumbling feet. 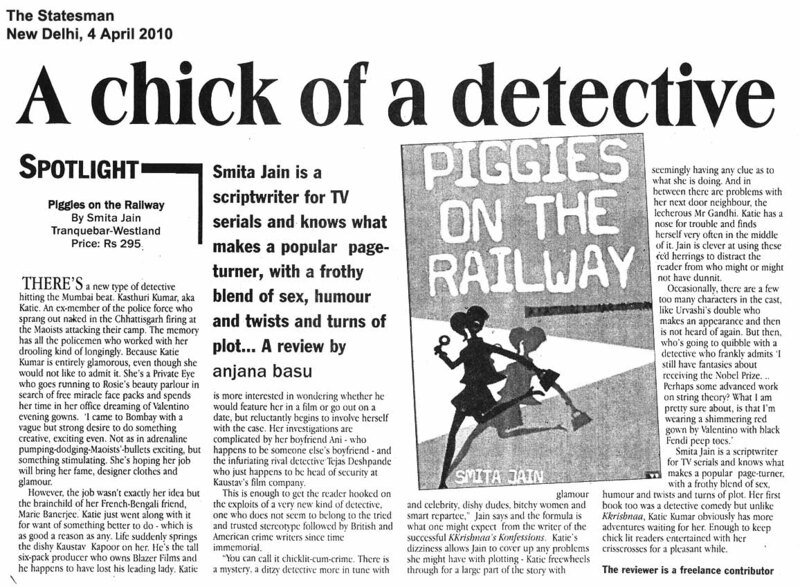 And ‘seasoned’ chick-lit writer Smita Jain pulls her off with elan. Smita knows what she is getting into. 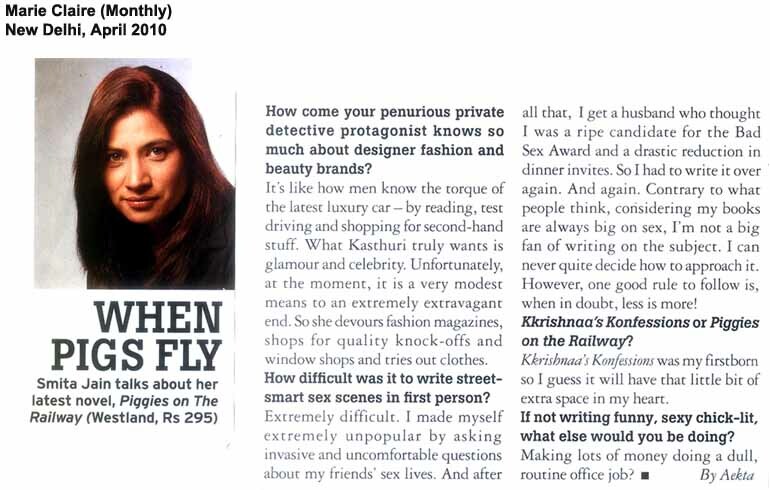 Her successful debut novel ‘Kkrishnaa’s Konfessions’ is compounding nto a screenplay for a Bollywood film and as she herself says: “I know I can write a decent murder mystery.” Smita is also curious, “Did you guess who the killer is?” she asks fervently. And I must confess I did not. 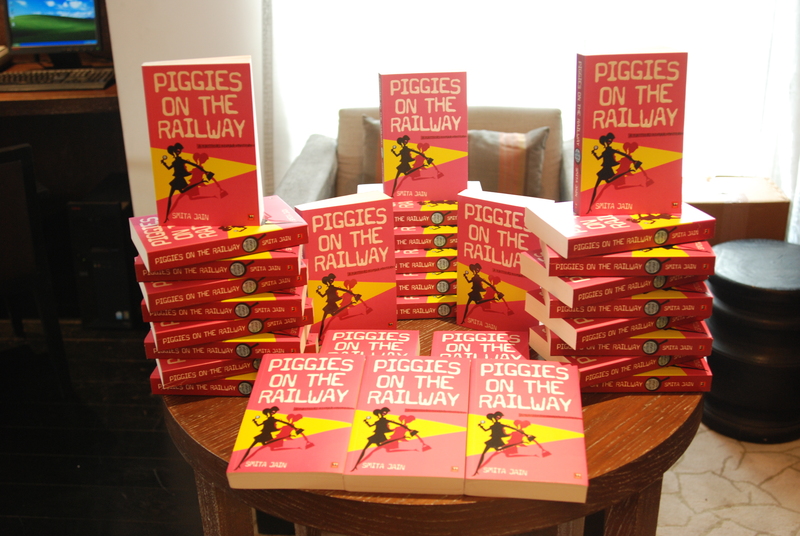 I was on the wrong railway track all along (much to this author’s delight!) and I certainly enjoyed the bumping ride! The first launch went off well. Everybody kept telling me I’m looking hot, so, come to think of it, it went off great. The venue was nice and cosy with a fine view of the monuments of Lutyen’s Delhi. The Park Hotel had gone out of their way to cater for the event and had prepared a delicious array of sumptuous snacks and finger foods. A special mention to Anushree Banrejee and Urvashi Malik of the Park Hotel for handling the event with such enthusiasm. Then, yesterday the whole day was spent talking to media. It was a packed day, tiring as hell and as much fun! The highlight of the day was me in my halter neck dress bringing the traffic at Parliament Street to a complete halt. I’m not joking. The dress which doesn’t garner a second glance from my bhaji wala in Bombay wreaked complete havoc in babu Delhi. It was hilarious! And now I have to leave. Some more interviews lined up, plus have to prepare for tomorrow’s launch at Gurgaon. I’ll blog about everything a little later when I have more time. Ciao!